The unofficial capital of the Champagne region – Reims is well known for its production of sparkling wine, widely known as champagne. You can find there a heritage of production of sparkling wine. You can visit the famous champagne houses in Reims, get to know more about the process of production and even taste one or two 😉 delicious champagnes. How to go to Reims from Paris? The best and the fastest way to go to Reims is by train. You can take a TGV from Gare de l’Est and arrive in the center of Reims in around 50 minutes! The prices of the train may differ from 22-50 € depending on when you book your ticket online. You can also take the popular bus company – Flixbus which takes approximately 2h to go there for even 7€. What are the best champagne houses in Reims to visit? 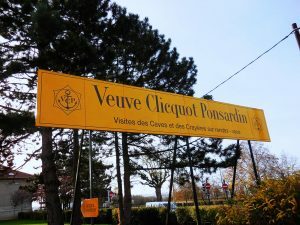 One of the best well-known champagne houses in Reims is Veuve Clicquot Ponsardin which is the number 2 best-selling champagne brand in the world. This orange label bottle is well recognized all around the world. Located just 30 minutes walk from the Cathedral of Reims, Veuve Clicquot Ponsardin champagne house offers public tours which last 1h-2h with the price range from 26-53€ per person. The Cellar tours are available from March 6th to December 29th, Tuesday to Saturday from 9.30 am to 12.30 pm and 1.30 pm to 5.30 pm. 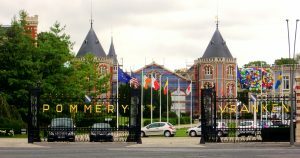 The next renowned champagne house is Pommery which belongs to the Vranken-Pommery Monopole Group. You can take the step into the Pommery cellars, get to know the techniques of crafting the champagne, see a contemporary art exhibit and taste some of the exquisite flavors. Tours last approximately 1 hour, and cost 22-30€ per person. The Pommery is open all week from 10 am to 6 pm, located 15 minutes by walk from Veuve Clicquot and 30 minutes from the Cathedral of Reims. 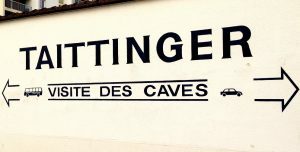 The last but not least is famous Taittinger which has one of the biggest caves where we can find 4th century Roman stone quarries occupying part of the cellars. The beginning of the tour is in the cellar, 17m underground, which the monks used as a place to store their wine. Taittinger cellars are open every day (closed weekends off-season) from 9.30 am to 5.30 pm and the prices for the tour vary from 19-55€. You can get there from the Pommery in 10 minutes, and from the city center in about 20. I would definitely recommend booking the tickets in advance on the official website of the champagne houses in Reims since some of them don’t accept walk-ins and they sell out really fast! Local champagne houses near Reims worth checking out! Not that far from Reims, in the countryside near the mountains, you can find some local champagne producers who will welcome you warmly, give you the tour on their vineyards and cellars, and share with you their history as well as the passion to the champagne. The first I recommend is Roger Manceaux champagne house, located in Rilly-la-Montagne, 20 minutes by car and 12 minutes by train from Reims. The house is open for visitors from Monday to Friday from 9 am – 12 pm and 1.30pm – 5.30pm and on the weekends by earlier appointment. 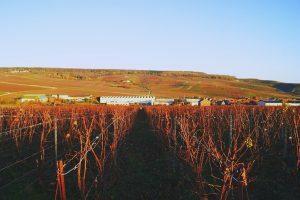 The tour costs approximately 10€ and you will get to taste amazing quality champagne made from their own grapes. The second local champagne house I would recommend you to visit is located 20 minutes by car from Reims city center in a village called Sacy. Wafflart-Briet Champagne provides tour and tastings in their small champagne house. They are a little bit expensive but definitely worth visiting. The prices vary from 110-200€ but the tour takes 3-5h with a lot of activities. Some of them offer lunch and pick up from Reims! If you are looking for exceptional experience, I suggest combining the 2 types of champagne houses together. Visiting one local and one famous could be the best idea to not only get to know the process from two different perspectives but also compare the flavors to find the one, you like the most. And it is definitely enough to understand the process of the production better and taste some delicious bubbly. It is a perfect trip for one day, so just hop onto a train or a bus and go to visit champagne houses in Reims and not only! If you are also a lover of the old architecture, the Notre Dame Cathedral in Reims is worth visiting. 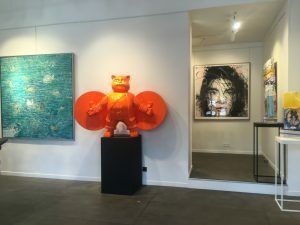 If you plan to visit France and love art you may want to consider checking out these exceptional art galleries in Paris. You will find them in one of the richest areas for historical art and architecture that Paris has to offer, known as Le Marais – an area packed with history art and culture, it is also regarded as one of the oldest and most prominent destinations for experiencing art and culture in Paris. Anne and Jean-Claude Lahumiere opened Galerie Lahumiere in 1963. 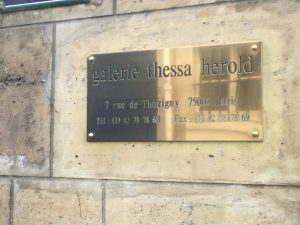 It is nestled within the charming district of Le Marais.This gallery is dedicated to preserving the geometric and “constructed” abstraction styles of art. While visiting, you can expect to find much of the art displayed emulates popular 1950’s and 1960’s style. Additionally, you can anticipate to see work from artists like, Cahn, Deswane, Gorin etc, and also contemporary artists such as Baudin, Bécie, Perrot, Stempful etc. Gallery Lahumiere is open Tuesday through Saturday from 2pm-7pm or by appointment. Modus Art Gallery was founded in the year 1996. 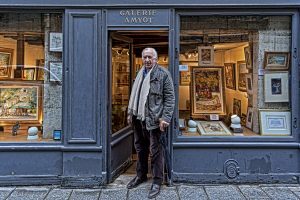 This gallery can also be found in Le Marais district of Paris. Here, you can see unique exhibits, which contain a mix of modern and contemporary works of art. The gallery showcases many talented, established artists but also supports young, emerging purveyors of art. The pieces displayed can range from paintings, sculptures, photography, and small objects, so as you can imagine, the price range varies as well! Modus Art Gallery is open everyday from 10:30am-7pm. The Art Concept Gallery was originally established in 1997 in Paris and in 2010, the decision to move the gallery to Le Marais district of Paris was made. Art Concept Gallery states they do not represent one particular artistic medium, so many of the pieces found in the exhibitions can be figurative or abstract. Past visitors have described the gallery as an “eclectic” collection defending contemporary art. Some artists that you have the opportunity to observe at Art Concept include, Jacob Kassay, Richard Fauguet, Julien Audebert, Ulla Von Brandeburg and Nathan Hylden among others. Galerie Art Concept is open Monday through Saturday, 11am-8pm. Emmanuel Perrotin is a French art dealer and collector specializing in contemporary art. Perrotin opened his first gallery in Paris in 1990, at the age of 21. 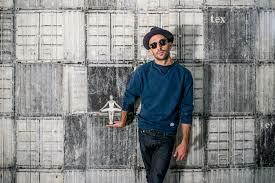 Since then, he has opened 18 spaces internationally in cities such as New York, Hong Kong, Seoul, Tokyo and Shanghai. In Paris alone, Perrotin has 3 gallery spaces that total 25,000 square feet. 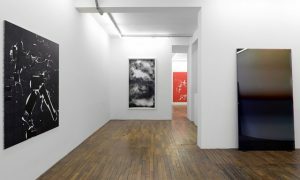 In 2005, Perrotin moved Galerie Perrotin to Le Marais district where he opened his showroom gallery at the Hotel Du Grand Veneur, which is also located in Le Marais. You can visit this gallery Tuesday through Saturday, from 11am-7pm. This exquisite gallery was originally founded in the 70’s under the name of Galerie de Seine as it was located on the left bank of the river. 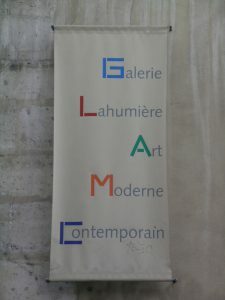 Then, in 1983 the gallery was moved into the Le Marais district near the Picasso museum. The gallery holds a handful of exhibitions each year where visitors can find features from artists ranging from the historic avant-garde style to contemporary artists.You can visit this gallery Tuesday-Saturday from 2pm-6:45pm. This art gallery is owned by a female art dealer and collector, Élisabeth Amyot. Visitors of this gallery can expect to find many visions of figurative art. Some of the artistist represented include, Richard de Prémare, Daniel Jaugey, Sarfati, Lehry-Bouisson, and Gaudin. If you love art of figurative nature, this is the gallery to visit!